This page is under construction... apologies in advance for incomplete info. The OEM airbox and intake ductwork is removed, and not reused as part of the kit installation. The Mass AirFlow (MAF) sensor is reused (this is an expensive part! ), but is recalibrated by a resistor in the extension cable shipped with the kit. WHY: The stock airbox is no longer needed, as Supercharger replaces the air intake portion of the engine, including the filter. The MAF needs to be recalibrated to account for the temperature difference between the incoming cold air, and the warmer intake air after it has been compressed by the blower. 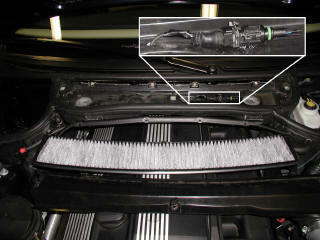 The oil dipstick tube is replaced with a new, modified OEM tube supplied in the kit. The modification is to add a fitting for the oil return hose from the Vortec unit. ESS does this by drilling out a hole in the tube, then welding on a small bent tube with a flange stop for the hose that is pushed on this new port on the tube. The kit comes with this hose already attached to the replacement tube. The mounting bolt for the dipstick tube also serves as a mount point for a support bracket for the Vortec unit. WHY: The Vortec supercharger is oil lubricated, so there must be a drain path for the oil leaving the blower. 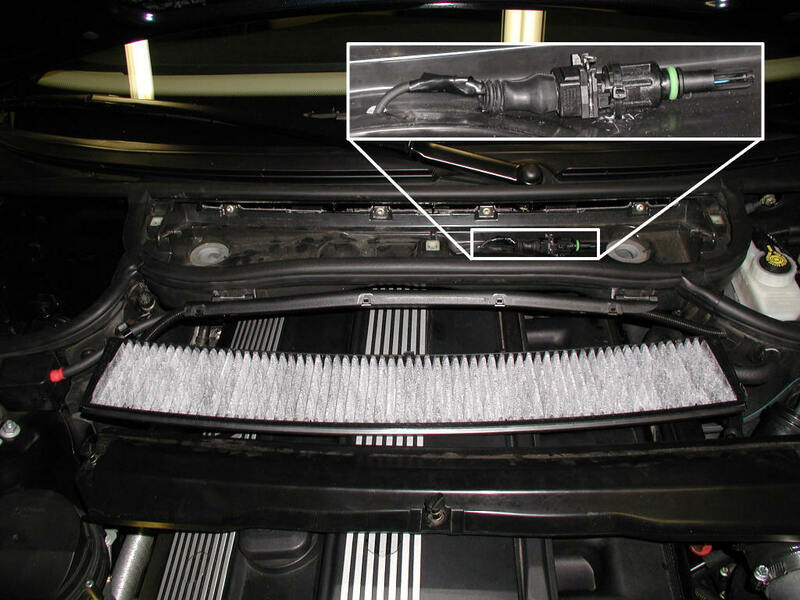 ESS chose to provide a drain path through the bottom of the dipstick tube, which is a clever solution, given the tube's convenient proximity to the blower, and the use of this method already by BMW for a stock drain from another part of the engine. The modified tube places the new drain right next to the existing one. One of the power steering fluid hoses going to the reservoir canister is rerouted with a supplied extension. WHY: Needed to clear the bottom of the Vortec unit. The power steering ATF servo fluid reservoir bracket is replaced with a modified OEM bracket that can clear the main supercharger mounting plate/bracket. WHY: One of the two mounting points on the bracket interferes with the large plate/bracket for mounting the V2SQ (location #2 in the picture). It appears that ESS uses an OEM part here that they have simply drilled out the two spot welds holding on one of the two sub-assemblies on the complete bracket, and removed it. In the modified configuration, the ATF reservoir is only secured by one bolt to the engine, however this looks to be more than mechanically sufficient. Pressurize oil to lubricate the Vortec unit is supplied by making use of the oil pressure sensor port on the engine. The stock oil pressure sensor is removed, screwed in to a supplied divider (1) that has a hose (2&3) coming from its other port to feed the blower, then the divider is bolted in to the original oil pressure sensor port on the engine. 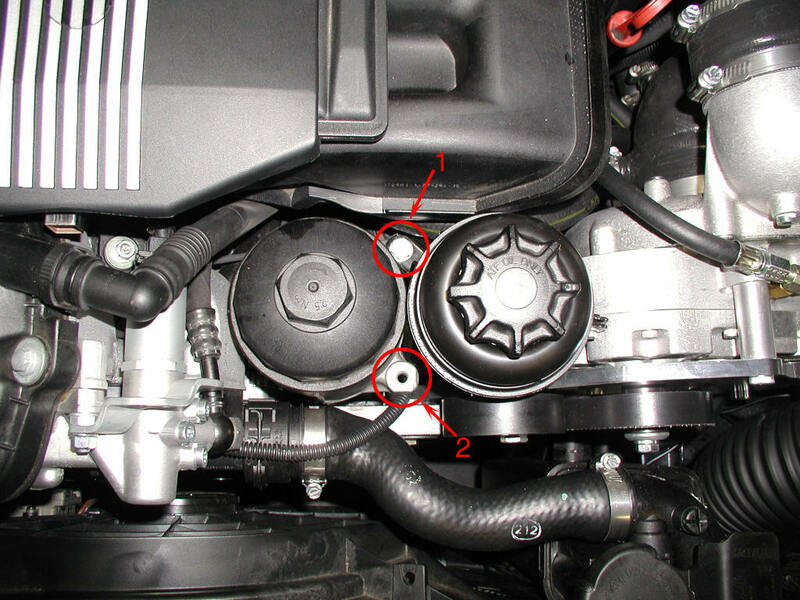 WHY: The blower needs lubrication, and this is a convenient location to tap into pressurized oil from the engine. The oil breather hose is rerouted to the intake port of the Vortec unit, from its original path into the intake manifold. The replacement oil breather assembly shipped with the kit turns this part of the motor into a vacuum actuator for the supercharger assembly bypass valve (see below for an explanation of the bypass connection). WHY: This modification closes off the intake manifold to essentially a sealed space with only the throttle and intake valves as openings. Therefore, when the throttle butterfly is closed, the engine cylinders are able to create a substantial vacuum in the intake manifold, that is then used to operate the bypass valve for the supercharger. My speculation (ESS doesn't explain the rerouting of the oil breather) is that with a connection to the crankcase through the oil breather assembly still intact, there isn't sufficient vacuum generated to correctly operate the bypass valve. The crankcase oil breather is alternately routed to the intake of the blower, serving the same purpose as when it was feeding the intake manifold, recirculating piston blow-by (oil and fuel vapors) to the intake path where their burned. The OEM fuel injectors are replaced with larger, higher flow injectors. The fuel rail mounting bolts are replaced, and the rail is elevated by supplied spacers to accommodate the larger injectors. 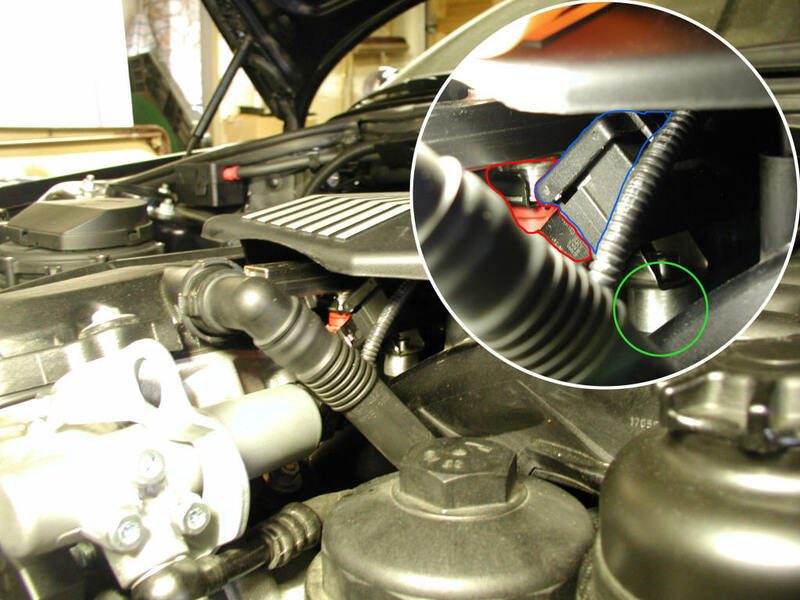 A bit of one of the injectors can be seen in the inset photo outlined in red, the wiring harness is outlined in blue, and the spacer for the fuel rail to accommodate the taller new injectors is circled in green. WHY: The blower increases the mass of air entering the cylinders by about 50%. This requires approximately 50% more fuel to achieve the right (stochiometric) fuel/air ratio, and get efficient, complete combustion without the creation of nasty polluting combustion products (NOx). The Engine Control Unit (ECU) varies fuel delivery by controlling the activation interval for the injectors when delivering fuel – the fuel system operates under a regulated, constant pressure, so the fuel quantity is proportional to the "open" interval for the injector. This presents a fundamental problem however: As more power demand on the engine and RPM increases, the injectors must stay open longer to deliver the correct amount of fuel – yet, the increasing RPM allows less and less time for the injectors to squirt gas and make it within the available timing window as the cylinder cycles. With the greater fuel requirement imposed by the boosted air, the stock injectors can no longer meet the demand within the engine timing window -- so larger injectors, able to deliver more fuel than the stock injectors for the same given activation pulse, solves the problem. Intake air temperature sensor (IAT) is relocated from the intake manifold to the interior air inflow box (where the replaceable air filter is housed). WHY: ECU calculations and programming depend on an accurate measure of the intake air temperature. The blower heats the air as it is compressed. The intake manifold, the stock location for the IAT sensor, is downstream from the blower, so measuring ambient air temperature there is no longer accurate. Relocating to the interior airbox is a good solution, as there is always airflow through there. A smaller support bracket is mounted using an existing bolt from the oil filter canister. WHY: Mechanical support for the main Supercharger mounting bracket/plate. The main Vortec support plate is bolted on to the front of the engine using the two existing alternator mount points. One of the original bolts is reused, the other is replaced with a longer bolt and spacer supplied with the kit. There is also a drive belt idler pulley that is replaced with a new one supplied with the kit. It appears to be the OEM pulley with the locating tab machined off (when you install the kit, the reason for this is obvious). The two support brackets mentioned previously are also bolted to this plate for additional support. WHY: Provides main structural support for the V2SQ. The MAF connector is extended with a supplied cable that includes a resister inside the shrink wrap tubing of the extension. WHY: Necessary to reach the new location of the MAF. The resistor provides the recalibration necessary to account for the compression heating of the air from the blower. The Vortec V2SQ Supercharger unit is bolted into the support plate from behind. 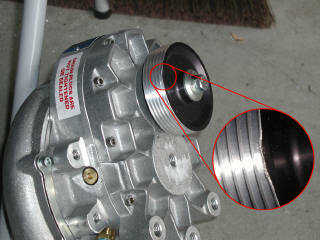 A new, longer serpentine drive belt is provided to accommodate the additional loop to the V2SQ pulley. Two mandrel bent steel duct tubes are installed. One is connected from the blower intake to the MAF and from there to the new K&N filter in the left front bumper via a flex tube, the other connects from the discharge to the throttle body on the motor. Connected between the two metal tubes is a bypass connection consisting of a rubber hose and a bypass valve operated via a vacuum line from the intake manifold, derived from the replacement of the oil breather assembly. The top radiator hose is replaced with a new one supplied in the kit. WHY: The shape of the original hose interferes with a new, additional idler pully on the main supercharger bracket necessary to route the drive belt over the SC pulley. The new hose is formed with a different routing path as seen in the picture to the right. This is a picture of the Vortec Supercharger unit before it was installed. I took this actually to document some damage to the drive pulley that the unit arrived with, so that I could email ESS the image and get a replacement pulley. Here's a shot of the engine and Supercharger. 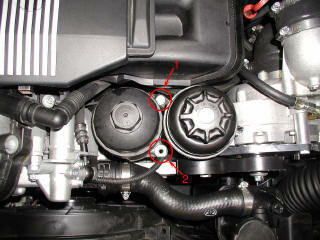 Supercharger is on the right, where the factory airbox (containing the air filter) used to be. Here's a shot of the nearly finished install, before the replacement drive pulley and reprogrammed ECU arrive from Norway. The radiator hose (shop rag stuffed in engine port where this hose attaches), main cooling fan, and radiator trim cover can't be reinstalled until the new pulley is installed -- gotta take the main drive belt off to do that. A side shot of the system with a better view of the tubing. These are steel tubes bent on a mandrel. The lower tube in the photo is the intake, and is attached on the left to the Mass Airflow Sensor and then a flex tube that goes down into the front left bumper where the K&N cone filter is located to inhale the coolest air possible. The other end fits into a 90° rubber elbow (that bends to the left in the picture) feeding the intake to the blower. The upper tube that comes off the blower is the pressurized discharge that feeds into the throttle body of the motor. Connected between them is a smaller diameter bypass connection, made up of a short rubber hose and a bypass valve, with an even smaller rubber hose plugged into the top that provides vacuum to operate the valve. It works like this: When you place demand on the engine by stepping on the accelerator, the throttle butterfly opens and passes intake air to the intake manifold. As such, the vacuum in the intake manifold decreases because of the open throttle, and in the case of the supercharger, it is actually at pressure higher than atmospheric (with a 7psi boost, 22 psi vs. ~15 psi). 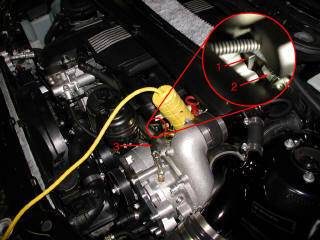 The control hose on the bypass valve is connected to the intake manifold. Because there is no vacuum in the control line relative to the ambient pressure around the valve, it closes, cutting off the bypass path. This ensures full, boosted air to the engine. When you take your foot off the gas, the throttle closes, cutting off the intake manifold from the intake feed from the Supercharger. However, the supercharger is still spinning at whatever speed the engine is going, despite the fact that the engine isn't producing power. This creates a significant overpressure situation in the tubing between the blower and the throttle body, and the air has to go somewhere. So, absent a bypass, all sorts of nasty hissing takes place and other ugly noises as the pressure backs up in the blower. Enter the bypass valve. When the throttle butterfly closes, the intake manifold becomes (for all intents and purposes) a closed space. The action of the valves and pistons produces some serious vacuum in the intake manifold, as the engine under these conditions is essentially an expensive air pump (the ECU cuts off fuel under such circumstances). This vacuum is use to open the bypass valve on the Supercharger ductwork which connects the intake and discharge tubes together, allowing the pressure from the discharge to simply route around back to the intake. Voila! No hissing or other scary noises coming from the supercharger. Here's a shot of the Intake flex tubing going into the front left bumper where the new air filter is. The front of the car (and left headlight assembly) is at the upper left; you can see a little bit of the Supercharger mounting bracket in the lower right.